After you have downloaded the file (take note of where you save the file), you will need to run it for it to be installed. Please note that the installation location needs to be the same as your DT Trainer installation location. If you are running a 32 bit computer, the default path is “C:\Program Files\DT Trainer”. If you are running a newer computer, it is 64 bit and the default path is: “C:\Program Files (x86)\DT Trainer”. If your computer has a “C:Programs Files (x86)” folder, you have a 64 bit computer. If your DT Trainer was not installed to the default location you will need to enter the specific DT Trainer installation location. 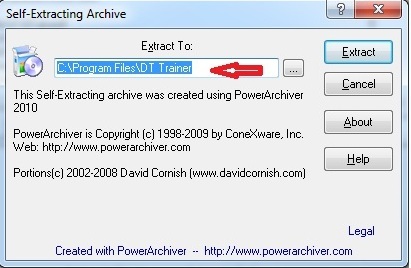 You can verify the installation location by right clicking the “DT Trainer Administration” icon, selecting “Properties” and locating the path. Remember to retest your reinforcers after you follow this procedure.